Jazz music, sassy aunts, and sweet home-cooking are nostalgically portrayed in Philip S. Bryant's memoir, Stompin' At The Grand Terrace. Technically a book of poetry, Stompin' also contains prose, photos, an extensive jazz who's who, and even a CD of music by Carolyn Wilkins. Bryant's way of storytelling may even inspire you to pick up a jazz record of your own, listen to music filter from those dark grooves, and think about the possibilities of life. Dizzy, Hancock, Parker, and Armstrong, and others may have inspired the poems, but Aunt Janey, Preston, and family life take center stage and shape the narrative. The first section, titled the same as the book, is all about the relationship Bryant's dad has with his friend Preston. Both men live different lives, but become inspired and animate in the presence of good jazz record and a cold beer. Bryant learns about jazz as he listens to them talk, and learns the ins and outs of how to be a man. Section two, “Stompin' With Aunt Janey”, is a soul pleaser. Filled with personality and attitude, the main focus, again, is family. There is very little about jazz, but the poems are high-quality and will make you smile. Janey and my grandmother were in low tones again. The final section is titled “Stompin' at The Corner Lounge: 75th & King Drive and Beyond”. The poems are a delightful hodge-podge of good-byes to great jazz artists, poems with personal dedications, and even Minnesota-inspired pieces like, “St. Peter, Minnesota: Barry Harris”, “Birth of the Cool: Minnesota”, and “Poinciana”. Bryant has a very conversational tone that is suited to his writing and with every turn of the page you feel like you grew up right alongside him. Whatever your background, this memoir will touch a nerve. Even so, it is definitively geared towards jazz lovers and music enthusiasts. 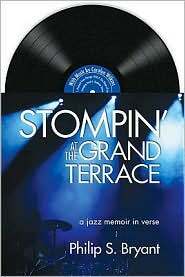 No jazz library would be complete without Stompin' At The Grand Terrace.